Resource managers in the United States use prescribed fire for a variety of purposes, such as to control vegetation, or reduce fuels that have accumulated in the forest. 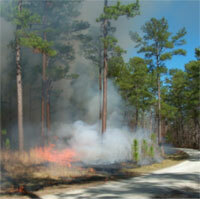 There is an interest to increase the amount acres treated with prescribed fires to promote healthy forests. This includes using fire to improve habitat for threatened and endangered species, and reduce heavy fuels that can result in severe wildfires. Though there are benefits to increasing the amount of area burned with prescribed fires, there is also a potential impact from smoke to human health and public safety. Prescribed fires release small particles (less than 2.5 microns in size) that can penetrate deep into human lungs and increase the risk of serious health problems. Furthermore, smoke plumes with high ground-level particulate matter concentrations increase the likelihood for traffic accidents to occur along highways. Two simple screening models have been developed by the USDA Forest Service to determine what impact particulate matter emissions may have on highway visibility and people's health in flat to rolling terrain. The VSmoke (Lavdas 1996) and VSmoke-GIS smoke dispersion models are classified as Gaussian models among people who are involved in estimating air pollution impacts. VSmoke and VSmoke-GIS are unique when compared to other point source (i.e. smoke stack models) Gaussian models in allowing the user to control what percentage of the smoke is dispersed at ground level, and how the remaining smoke rises to maximum height in the atmosphere. The VSmoke-GIS model uses many of same calculation as VSmoke (Lavdas 1996), but the output is displayed in the ArcMap or the ArcView software, developed by Environmental Systems Research Institute® (ESRI). The VSmoke-GIS model predicts the maximum downwind distance a PM2.5 (fine particle) concentration is predicted to occur. The user of VSmoke-GIS can enter up to 10 fine particle concentrations to evaluate, or choose the 5 fine particle concentration that relate to the Environmental Protection Agency's air quality index (AQI). Please note the hourly fine particulate matter AQI values were obtained from a publication from the California Air Resources Board. 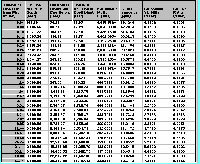 VSmoke (Lavdas 1996) is a model that estimates downw ind concentrations of particulate matter at 31 fixed distances, and how far and how well a person may see through the smoke plume at each distance. Also, VSmoke provides estimates on the dimensions of the plume above the ground at each of the 31 distances. Resource managers should use the VSMOKE model when there is a need for detailed analysis. This is true when a conservative approach like VSmoke-GIS is used first and there are indications for a potential problem from a prescribed fire. Version 2 continues to provide an interface to the two dispersion models and has added an interface to the Forest Emissions Production Simulator (FEPS). The FEPS model produces hourly estimates of PM2.5 and heat release rates, which are then used by VSmoke and VSmoke-GIS to predict the downwind concentrations.